At the start of the year Mum bought me these school shoes, which at the time, I didn’t really mind. But as soon as I tried them on I realised looked like Bigfoot and Oh my Gosh how could I ever wear these to high school. So I got out my old school shoes, that were three years old, and cracked in half with the stuffing falling out, but made my feet look smaller. 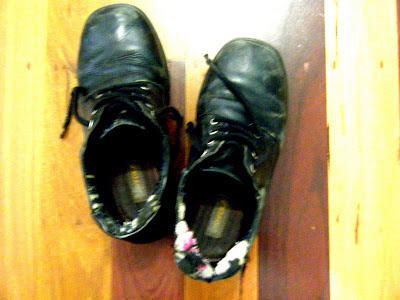 And I wore them for about half a year. Mum groaned every time I stepped out of the house and several times I have tried to have a nice conversation and the whole time this person would be staring at my boganish shoes in utter horror. And I know for a fact my LAN teacher, Ms Schowey, did not like them one bit. >How beautiful. Your new shces are like ballet slippers. You must dance thru your day now. I'm so happy you have a fairy gramother. >Oh goodness, the old shoes are really dead aren;t they!? >I love my new shoes, and yes, I will dance through my days now. Nicole- Thank you for the link. I love Topshop and Alexa Chung and Tavi. It's just such a shame they don't have Topshop in Australia. Maria- yes, I think I have feet growth failure. hello I’m come from china!